shoots portraits and musical acts, and takes photos like this of the great outdoors. This is a landscape shot of a mountain range in Alaska. 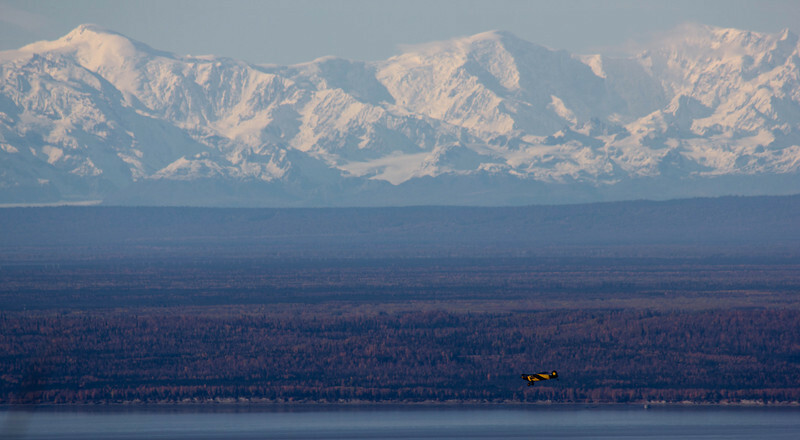 The photo is composed of three horizontal bands; the water, tundra and then the mountains rising dramatically in the background. The small aircraft gives a sense of scale and adds a color contrast to the mostly blue hues. The photo gives a feeling of wide open spaces. I chose this photo because it reminds me of Seattle where I grew up, with the mountains all around. I also wanted to show off the work of my friend.